Jay Parks is the pastor at New Life Church. 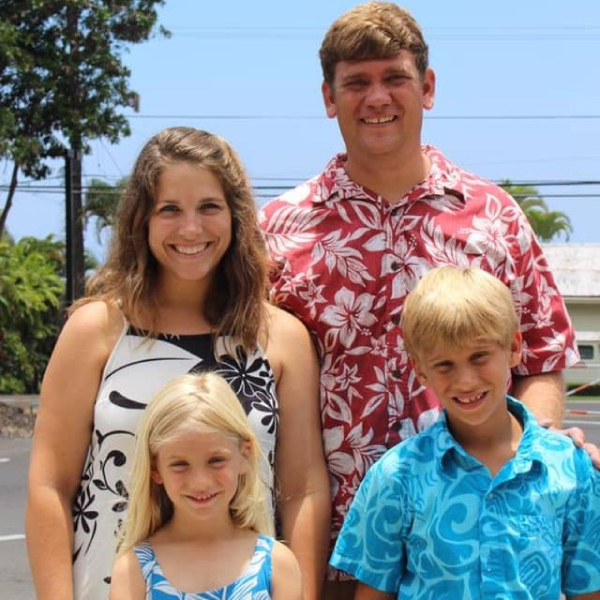 He and his wife April, as well as their two children, moved here from Mississippi in 2015 to plant New Life Church in Kona. He is a graduate of New Orleans Baptist Theological Seminary and has been in ministry since 2005. He is passionate about preaching God's word and doing one on one discipleship with men. He enjoys family, fishing, and spending time with friends. Mark Aiona was born and raised on the Big island. Music was always a part of his life through the Church, Church school as well as family gatherings. As Mark discovered God's love through the Bible, his motivation to sing for Jesus compelled him to take guitar lessons as a young adult. 40 years later today, Mark currently serves as the Music and Praise Leader of New Life Church in Kona. His goal in music ministry is to uplift God the Father and Jesus through music. Mark and his wife Tammy have lived in Kona since 1994. They have two daughters and one grandchild. He enjoys surfing, canoe paddling and playing music. Austin & Alison Sunderman are originally from Clarinda, Iowa and became best friends in high school, attended college together and were married on July 19th, 2003. They have a 10 year old son, Elijah; a five year old daughter, Elladee; and a three year old son, Jordan. Austin entered vocational ministry at North Heartland Community Church in Kansas City in 2007; his roles included director of youth ministries and leading church-wide community service and world missions teams. In his free time, Austin enjoys biking, reading, snorkeling/swimming, and enjoying all the adventure the big island has to offer. Our family completed a Discipleship Training School (DTS) with Youth With a Mission (YWAM) in Romania in 2011 and traveled to Thailand for outreach. We joined the YWAM Kona staff in January of 2012 – Austin is currently dividing his time between the Ending Bible Poverty Now team and assisting with New Life. Alison concurrently serves at the Aloha Kona Urgent Care Clinic and the University of the Nations Campus Clinic. Besides being best friends for the past 20 years, we are super competitive, prefer to be outdoors and often settle trivial matters with a simple game of rock-paper-scissors! Alison is married to Ross and they have two children, Erik and Lily. Alison is originally from California but has lived in Hawaii for nearly ten years. She is a teacher at Makua Lani Christian Academy to junior high students as well as a college counselor to seniors. She loves students and is passionate about walking with them and pointing them to have a passionate relationship with Jesus.